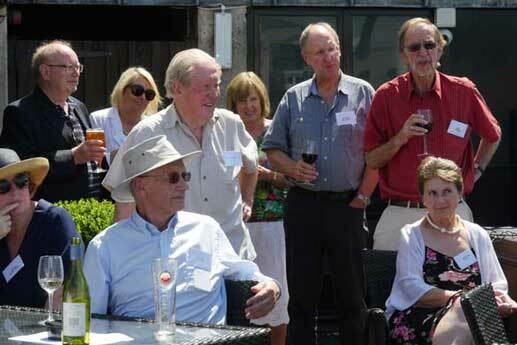 We were blessed with another gloriously sunny day for this year’s summer party on 5th July, held once again in the Terrace Bar of Doggetts Coat & Badge, overlooking the river at Blackfriars. The Pimms and wine flowed as easily as the conversation, and the food was both plentiful and enjoyable – a buffet lunch ranging from sandwiches to cold meats, cheeses and salads. Our Chair, Adam Phillips, struggled a little to make himself heard without amplification but, after welcoming a number of guests, he reminded those present of the potential for ‘Research Aid’ – retired members volunteering their expertise in the service of charities. Jane Gwilliam briefly described her own recent rewarding experience of such voluntary work. Adam also appealed for written contributions to the Newsletter on the development of different research techniques; there will be more on this in next month’s edition of the Newsletter.